Where does the name "am Ende" come from? "Am Ende" is German. "Am" is a contraction of "an dem." "An dem Ende" or "am Ende" translates as "at the end" or "on the end." As you can see in the sign photographed in the Frankfurt airport, "am Ende" does, indeed mean "at the end." Note the capitalization. Germans capitalize all nouns. 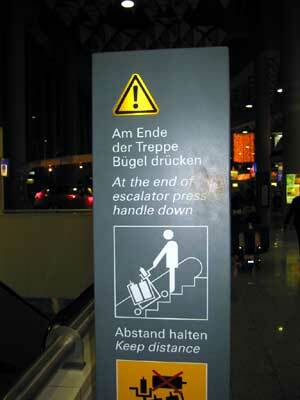 In the sign end/Ende, escalator/Treppe, and handle/Bügel are all capitalized. Other words, such as the verb press/drücken isn't capitalized, nor is the/der. The "am" is capitalized here only because it is the first letter of a sentence.